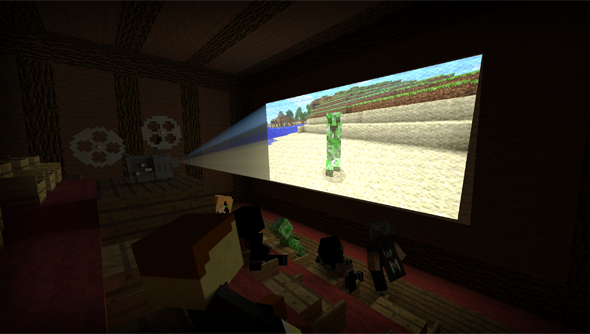 Like a carrot tied to a stick affixed to the pink nape of a pixelated pig, the prospect of a Minecraft Movie has some of the most successful names in Hollywood animation and comedy trotting to Warner Brothers’ tune. The Lego Movie producer Roy Lee has already hopped aboard the Minecart, and now Shawn Levy is in talks to direct. Hollywood journal Deadline have it that Warner Brothers are “in talks” with Levy to helm the Minecraft feature film, which the studio signed on to make in February. Levy has a busy history of workmanlike Hollywood comedies, from the now-trilogy Night at the Museum films, through Google Campus-set jolly The Internship, to Tina Fey vehicle Date Night. He’s most recently found a more distinctive voice in This Is Where I Leave You, an acerbic story about a family forced to spend a week together after the death of their patriarch. That film was made with Warner Brothers, and the experience has evidently been positive enough to draw Levy back. Producer Roy Lee worked with Dan Lin on The Lego Movie, and before that on How to Train Your Dragon. Hopefully he can advise Levy on how to retain some of the breathlessness, irreverence and thematic truth of those films. Will Levy do, do you think? Personally, I’d rather see Lego Movie and Jump Street co-directors Phil Lord and Christopher Miller on board.